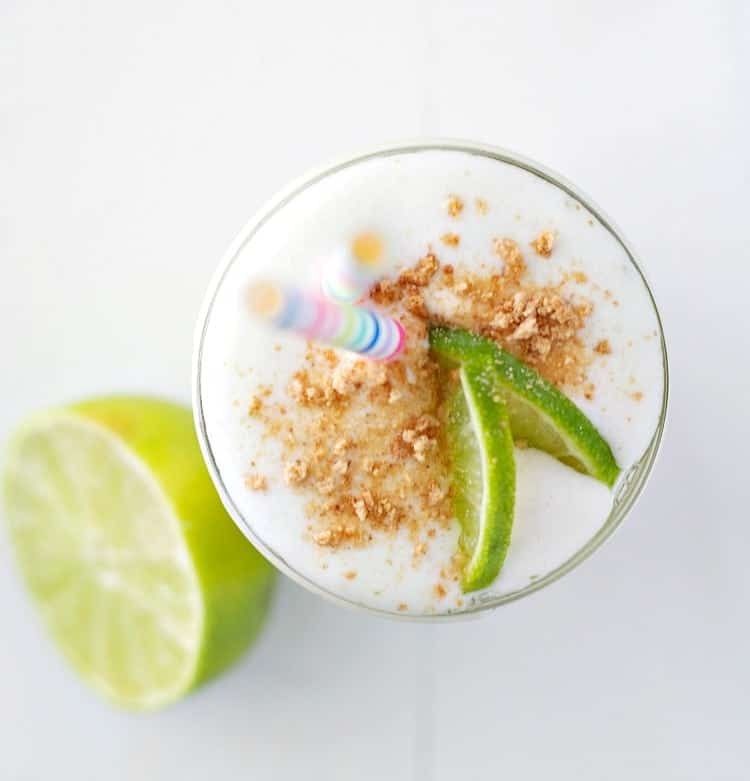 A sweet, tart, and creamy Easy Key Lime Pie Protein Smoothie is the perfect healthy breakfast or clean eating snack to satisfy your sweet tooth! So this idea originally came about when I was dreaming of GREEN foods for St. Patty’s Day. But guess what? It’s not soooooo green (unless you count the little green flecks of lime zest sprinkled throughout!). I briefly considered adding a few drops of food coloring to make it really festive, but then I decided EWWWW…no, thanks. 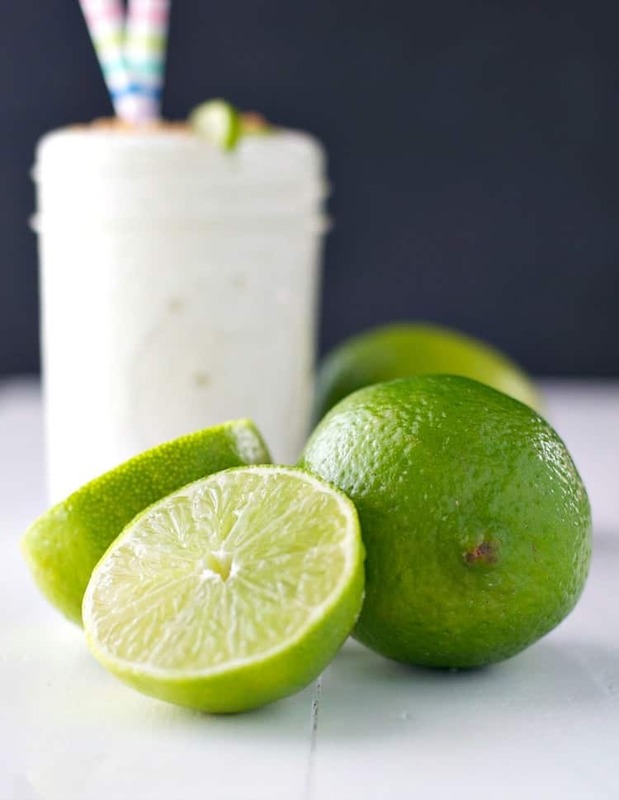 Instead I settled for a less vibrant and easy key lime pie smoothie (that’s still bursting with flavor!). Ya with me?! Whether it’s green, white, or somewhere in between…this protein smoothie is such a delicious way to celebrate the EVERY day (not just a holiday). It’s full of protein and vitamin C to help keep you healthy, strong, and fueled. BUT, with a sweet graham cracker crumb topping and a smooth, creamy base, it’s tasty enough to curb those real pie cravings! Snack time? Dessert? Check. Check. I often rely on the convenience of packaged, organic, wholegrain graham crackers for the boys and myself, but if you have a few spare minutes (and really, that’s all you need! ), you can even make your own Homemade Whole Wheat Graham Crackers with one bowl and a couple of pantry staples (no mixer required!). Grab my recipe HERE — they can be crumbled on top of the smoothie, but they’re also just a really great make-ahead snack or addition to breakfast on-the-go. Totally freezer-friendly, too! And be sure to go with some fresh lime here (not the stuff in a bottle) for maximum taste and quality! Bonus points if your grocery store actually sells KEY limes!! Can’t beat what Mother Nature gave us! 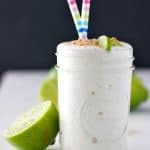 If you’ve tried this Easy Key Lime Pie Smoothie or any other recipe on The Seasoned Mom then don’t forget to rate the recipe and leave me a comment below! You can also follow me on Facebook, Twitter, Instagram and Pinterest to see what I’m getting up to. You make the best smoothies, Blair! I’ve never even thought to make a lime smoothie before, so I’m loving this delicious combo. And even better that there’s protein in it, too. Just what I need to get going on this Monday morning! 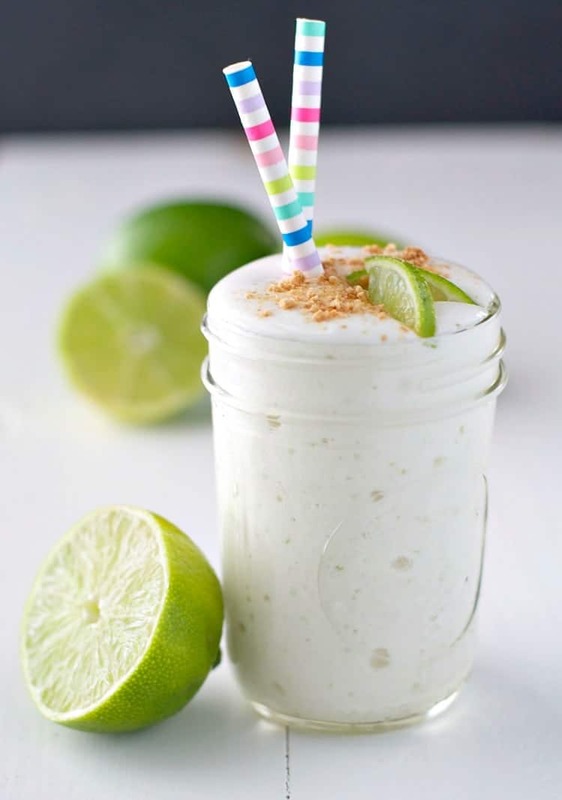 Key lime pie smoothie sounds and looks heavenly! You’re killing it with the protein smoothie game a always! Oh Blair this looks so good and those straws are adorable too! This is a delicious sounding smoothie, Blair!! 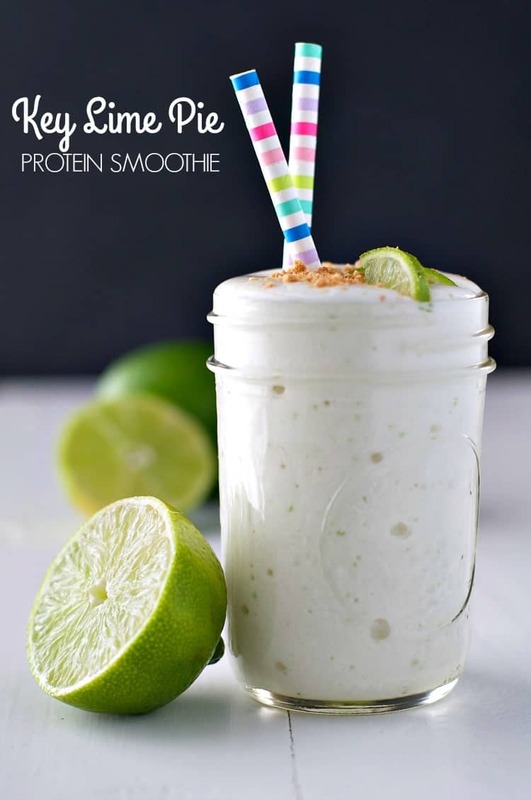 Key lime pie is my favorite and I love that you turned it into a healthy protein drink! You make fantastic smoothies, Blair, and this one goes to the top of the list – wow! Lime just makes everything better, doesn’t it? Thanks, Robyn!! I’m smoothie obsessed, and this is definitely a favorite!! OHHHHHH MY FRIG! whaaaaa?! I need this! In fact I really need ALL of the smoothies you have made, IN MY MOUTH! Oh I am SO glad you didn’t add the food coloring. 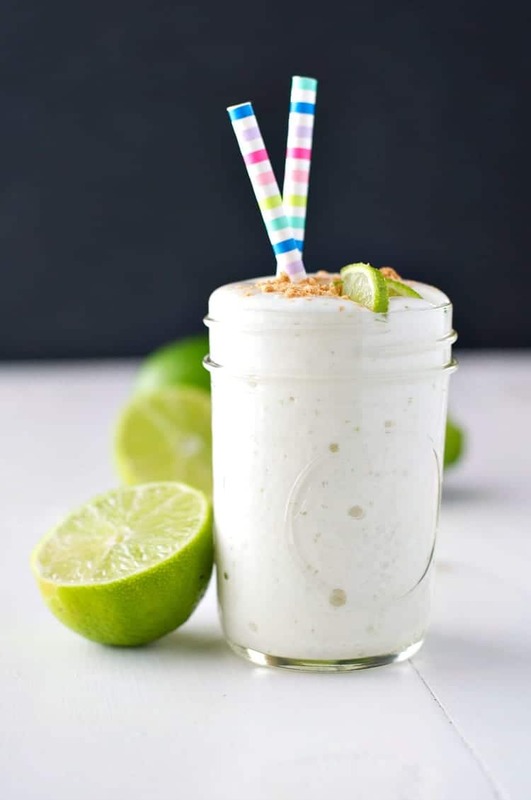 This smoothie is so beautiful as is, and it totally screams key lime pie. That is my hubby’s fav dessert so I know he’ll love this! Weekend treat!! Yep, perfect weekend treat for the key lime pie LOVER! 🙂 Thanks, Chrissa! My boyfriend loves key lime pie . We made this recipe after a hard workout and with our last scoop of protein in our house. The drink came our way to sour and neither of us could drink it. We tried to mix in more almond milk to drowned out the sourness. Nothing worked! Please don’t give your toddlers protein powder with sucralose in it. I used Hemp powder because I didn’t want any powders with artificial sweeteners. Added yogurt. It’s alright. Very tart. I’d use less lime next time. 2 grams of protein does NOT make a protein smoothie. Sounds wonderful but the protein is practically non-existant. You’re right — that wouldn’t be much protein! 🙂 That was a typo — it should say 23.5 grams of protein. I updated the nutrition panel to correct it. Thanks for letting me know!